When I heard Kristen, my neighbour’s daughter, sing for the first time on youtube last week I was so moved by her beautiful voice and very natural and joyful talent on the stage. It was a challenge to do justice to the cupcakes her mom asked me to bake for her birthday on Sunday as I wanted to stick with a music theme and make them pretty and girly too. I made the sheet music with white sugarpaste cut into a rectangle onto which I stamped music notes with edible colouring. The microphones I moulded and then rolled in edible silver rolkem glitter and I found these effective black music notes at Jodees in Strydom Park. I know Kristen was delighted with the end result and they were eaten almost before everyone finished singing ‘”happy birthday'”. Here’s to you Kristen and with your amazing voice you have the world at your feet. Love the music sheets! What a clever idea. I’m sure Kristen loved them. I listened to her on youtube – she really has a stunning, clear voice. Once again you have outdone yourself Lisa! Thanks Tracy to you and everyone who leaves comments. I really love the different comments as it gives me the inspiration to keep blogging all the new cupcakes I am making for orders. Wow, they are so gorgeous Lisa! Love the microphone and the music sheets! Well done. Thanks Michelle. 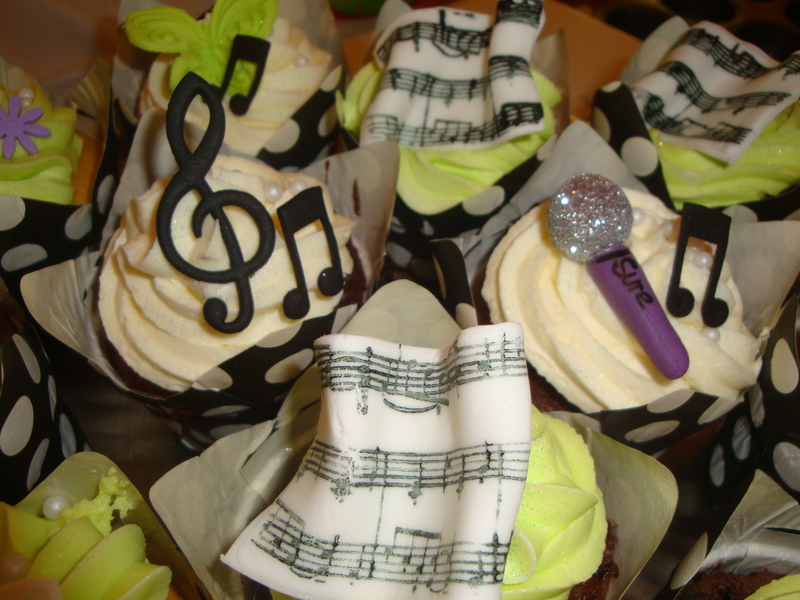 I stamped the music sheet with music notes using edible colouring so whether I am doing sugar art or scrapping I am still stamping!